Is it just me or do you always want to give the best gift?! Something that totally wows and makes your recipient smile from ear to ear? I always try and think of gifts that will last. I love focusing on less material type gifts and more experience based. The possibilities are endless! Because it really is so exciting to have something to look forward to after the holidays! 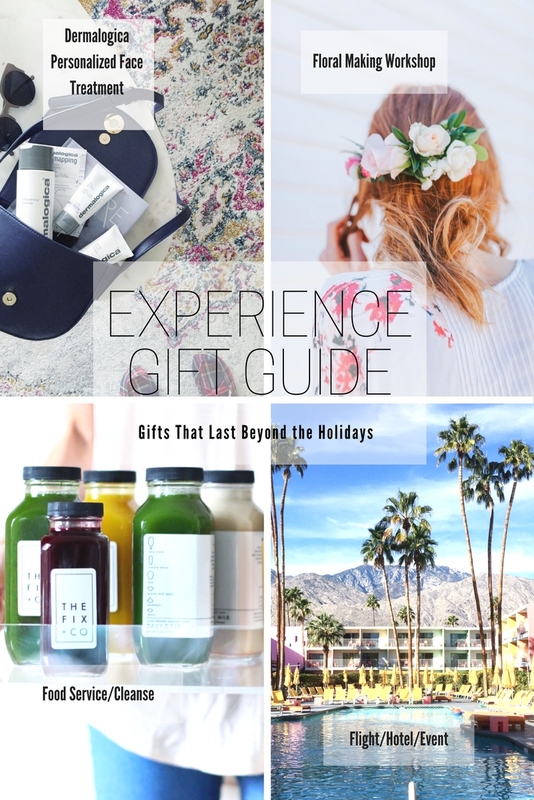 I'm rounding up some fabulous experience type gifts that you should consider this holiday season. It's also great because most of them can be ordered online and printed out. Then you can get creative and wrap them up all fancy. Just don't put a gift card in a huge box... so over that one! Dermalogica ProSkin Treatment-- there is a reason this isn't called a facial, but a skin treatment. The professionals at Dermalogica are so knowledgeable on skincare! They tailor a completely personalized and customized experience based on your skin needs. Basically, they tell you exactly what you face needs, they use the most advanced products and get you set up for healthy skin. For someone that is new to skin treatments, or a lover of them, this is the perfect indulgence. So often we are reluctant to spend money on treatments that are perceived as luxuries, but this one is a necessity to really get a deep clean and a rundown on what your skin truly needs (before it's too late)! Floral Workshops-- a night of fun and florals! Sounds perfect to me! This is such a great gift idea. I mean you get together with some fabulous ladies, learn all the tricks of floral arranging and get to leave with a bouquet you made yourself! These are skills you will have your life and for the one who loves crafting, florals and just is a purveyor of pretty things, the experience will be the best! Wild North Florals has some of the best workshops on how to keep houseplants alive, centrepiece making and DIY terrariums! Also, check out Bloom School. Cleanse-- after the holidays we could all use a re-set from all the parties, wine, food, and indulgences. It can get to be a lot! I love the Body Reset cleanse from The Fix + Co. because it's not a juice cleanse. If you are like me you just need to chew! I love that this one incorporates meals into the mix that are plant-based, healthy, homemade and super delicious. Event/Outing-- there are so many events happening around the city. All you need to do is pursue through StubHub or Ticketmaster. Think concerts, sporting matches, even the Jays season pass. I love gifting tickets because it really gives you something to look forward to. And you get to do it together! Another great option is a flight, or gift card to a travel service that you know they'll use. Nothing is better than having a trip to look forward to! What are some of your favourite alternative gift ideas? I'd love to know!